Big brands are finally doing their P.A.R.T. in sustainability and it may be the future of loyalty. Spending the first decade of my career in brand research, I learned a lot about how marketers measure brand loyalty without ever using the term. Looking back on it, these are incredibly self-serving ways to gauge someone’s experience and perceptions. We were exclusively exploring how the consumers fit the brand into their life, rather than the brand fitting into the consumers’ life. Up until last week, I was not convinced that the dominant for-profit brands in today's market are doing much better than they were 20+ years ago. That changed for me when Loopannounced an upcoming 2019 pilot with some of the world’s biggest brands to reimagine the milkman use & return model by delivering beloved household brands through reusable containers. 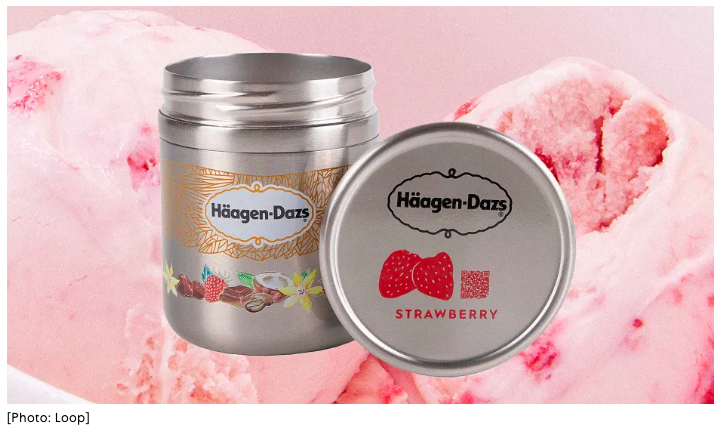 This partnership, focused on Paris and New York, aims to reduce single-use packaging for the consumer for products under P & G, Nestle and Unilever among others. What does inspire loyalty today? It's not easy for brands to stay on top in a world where the sharing economy is increasing (Lyft, AirBnB, Silver Car), subscriptions models are on the rise (Amazon Prime, Netflix, BlueApron) and disruptive brands are stealing share from legacy brand giants (THINX from feminine care brands, Capsule from store pharmacies and Rent the Runway to major retailers). According to Harvard Business Review's thought-provoking article “Customer Loyalty is Overrated” by legendary marketer A.G. Lafley and influential business thinker and professor Roger L. Martin suggest that what makes a brand’s competitive advantage truly sustainable is not having a consumer make the perfect choice, but rather the easy choice. Consumers, they argue, prefer the habitual response rather than engaging in conscious consideration. It’s not addressing the responsibility that brands are expected to have by consumers. It’s underestimating the informed nature of today’s consumer. By prioritizing the habitual ‘ease of choice’ in a consumer-brand exchange we run the risk of alienating potentially loyal consumers. 66% of consumers are willing to spend more on a product if it comes from a sustainable brand according to Nielsen. 81% of millennials even expect their favorite companies to make public declarations of their corporate citizenship according to Horizon's Finger on the Pulse report. More than nine in ten millennials would switch brands to one associated with a cause according to a study by Berkley Haas. Brands need to be more responsible and think beyond the transaction alone to be future-proof. At Seiden, the majority of our clients are non-profits so we understand mission-driven marketing. Increasingly in the last few years, we have worked with more for-profit brands who want to define and communicate their purpose. There are many avenues we take for a brand to become future-proof regardless of their core business model, digital presence or tolerance for disruption. Purposeful - discover ways give back in the business model and communicate it simply. Accessible - provide convenience through online transactions & services, subscriptions, delivery or partnerships. Relevant – stand for something outside of purely selling a product/service. Thoughtful – take the time to understand how to be of value to their consumer and make their life easier. About Seiden: Seiden specializes in uncovering opportunities for brands to be more mission-driven, regardless of their profit model or existing business plans. They leverage innovation, consumer trends and future-focused problem solving to keep business relevant and connected to consumers. Walking the talk of Mission-Driven brands, Seiden gives back by offering a project to the charity or cause of a client’s choice for each engagement. About the author: As Chief Strategy Officer at Seiden, Kate Charles is responsible for keeping clients up to speed on trends and finding ways to keep their business relevant amidst constant consumer change. Before joining Seiden Kate ran Insights & Planning groups at 360i and Hall & Partners.